The Joker is dead. While fighting his legendary arch-nemesis, Batman killed him by accident, pushing the Joker into one of his own deathtraps and crushing the Clown Prince of Crime between two grindstones. But who does Bruce Wayne see the next day walking on the streets? After multiple encounters with the Joker, or his double, or whatever it is, Bruce Wayne decides to check into the finest hotel in Gotham City, the New Era, where something fishy seems to be going on. These are the events of Death of the Dreammaster by Robert Sheckley, a Batman story collected in The Further Adventures of Batman. It is the first story of the collection, and it has got the most imaginative build-up of any Batman story I’ve read thus far. From what I’ve discovered, Sheckley was known for his science fiction output, but he wrote some novels involving mystery and espionage. 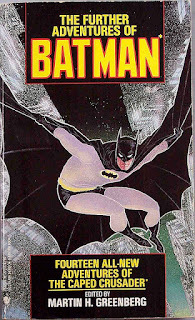 And to be honest, if I didn’t look up Sheckley, I might have mistaken him for a hardboiled mystery novelist, because that is the best description I can come up with for this Batman tale. 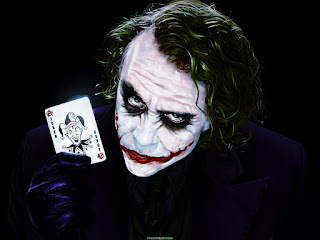 (a) The Joker comes back to life after being crushed between two grindstones. 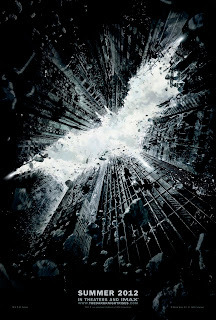 (b) The Joker (or his double) enters the New Era Hotel with Bruce Wayne hot in pursuit… but when Wayne enters the hotel a few seconds later, the Joker is nowhere to be found and everyone in the lobby swears that nobody came in before Wayne! (c) A plate of food brought to Wayne’s hotel suite briefly changes into a collection of snakes, etc. (d) The Joker disappears from a hallway with Wayne hot in pursuit. (e) Hearing a loud noise, Bruce Wayne enters another suite to find a woman with her throat cut, a ghastly grin on her face. He goes to telephone Commissioner Gordon, but when the men re-enter the room together, there’s nobody in sight! Okay, the last one does not seem like an “impossible crime” but later in the story an aura of impossibility is given to it. As you can see, this is one of the most intriguing build-ups of mysterious events that I have ever read. Unfortunately, my mistake was to expect a mystery in the traditional fair-play mode. Instead, we get more of a hardboiled mystery: Batman must collect the clues for himself and only once he’s got them all in place he knows who the culprit is and what exactly has been going on. It isn’t that the author is cheating his readers—although I’m not entirely sure how Batman knew for certain that X was behind all this—but that Batman has to assemble the evidence at the same time as the reader. There’s no way to make the culprit a character in the story without making him seem somewhat suspicious, so this is simply avoided. It’s a big shame, too, because if the story was a fair-play mystery, it would have had some fantastic misdirection aimed directly at the Scarecrow, one of Batman’s most nefarious opponents. 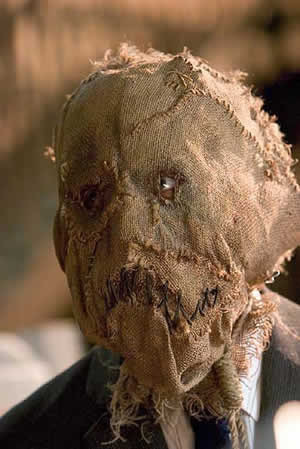 I was convinced that the Scarecrow and his fear gas was behind much of the plot for some unknown reason, but the truth is instead grounded in several classic hardboiled themes. And the story again lets readers down in explaining all the impossibilities. Briefly put, this is an explanation that holds water only in the Batman universe. We get plenty of high-tech stuff involved (there’s deliciously ironic moment when Batman pulls out a customized laptop; I suspect that the machine I’m working with now is better than that puppy!) and to be frank, if this wasn’t Batman, I would have thrown the book across the room. It’s a very uninteresting explanation involving little ingenuity. But that being said this is a great read nonetheless. If you want to see Batman the Private Eye, the Caped Crusader acting as a gumshoe, this is a great read. There are so many fantastic scenes, such as when Batman breaks into a factory where the terrorised owner lies in wait, fearing something unknown. The solution, while not a paradigm of fair-play, has some interesting elements. And most fun of all, Batman has to deal with people who are constantly reminding him that he isn’t invulnerable like Superman, to which he grudgingly responds that Superman is “okay”. (Take that, Frank Miller!) In short, Death of the Dreammaster is a great read for the unashamed Batman fanboy. 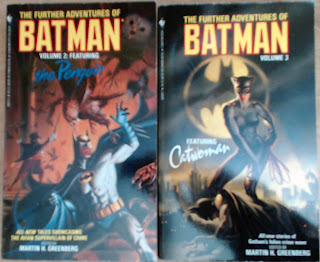 An addendum, entirely unrelated to the review: Since writing my last review, a package arrived for me from Barry Ergang, containing two more books in the Further Adventures of Batman series (see above). 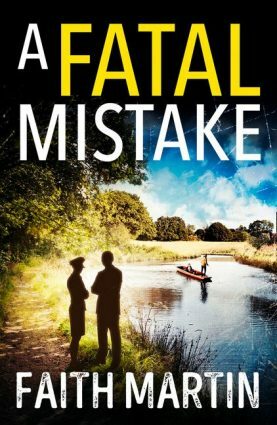 For those of who you don’t know Barry, take a look at his website, which has plenty of terrific books for sale! When Barry describes a book as being in good condition, you can be sure that it is in good condition and that it will arrive in good condition! I’m thrilled to have these two volumes, especially since Catwoman is in The Dark Knight Rises, and I will definitely be including some stories from these books! Thank you so much, Barry! But wait! There’s more! After my last review, I got an e-mail from the usually annoying Amazon (often simply regurgitating recent searches back to me), when suddenly I was informed me that Martin H. Greenberg actually edited three more Batman short story collections: Adventures of the Batman, Legends of the Batman and Tales of the Batman! Being an insane fanboy, I immediately went to Bookfinder.com and found these three books. I have ordered them and eagerly await their arrival. One of these has Poison Ivy and Mr. Freeze on the cover, so perhaps these tie into the last two 90s Batman movies. (Can we expect some Riddler? Please?) Edward D. Hoch has at least one story in these additional volumes (apart from the story I’ve reviewed, he’s also got one in The Further Adventures of the Joker), so I feel my purchase is already justified. And hey, what’s the worst that could happen?